Many photographers will often note that their sunrise and sunset images rarely represent the scene they observed. By detailing the specific steps of his creative workflow, both in the field and in the digital darkroom, Christopher details how to successfully translate what your eyes see during one of the most challenging times of day to photograph, and be able to represent that experience visually by using a combination of camera and processing techniques. This eBook will allow you to transcend the disparity between what you see and your results, allowing you to create realistic, vibrant images of this beautiful light. The “golden hours” refer to the window of time when the sun is at its lowest point in the sky, just before it sets or right after it rises. As the sun nears the horizon, the light begins to dramatically transform the landscape before you. The atmosphere becomes thick and golden, shadows are lengthened, and highlights are brightened. Soon your scene develops texture, depth, and becomes a stunning show of light. It’s a highly-coveted time to photograph the landscape, but is also challenging to many photographers as the uniqueness of this light requires a specialized workflow to capture. 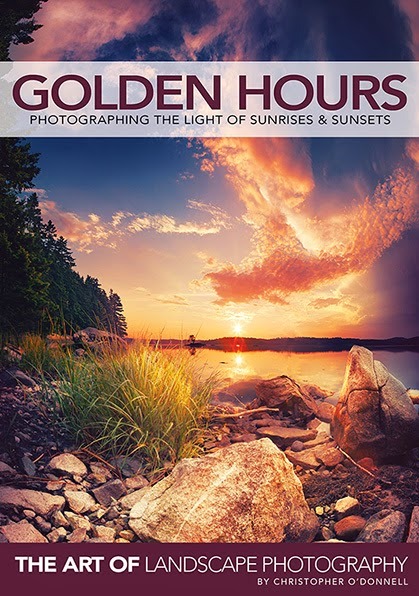 In this 179 page eBook, you will find detailed solutions to the challenges this light presents – from compositions to exposure difficulties – so you can begin to photograph the golden hours with confidence and accuracy. With this new knowledge, you can focus on enjoying your photography while expanding your creative horizons. 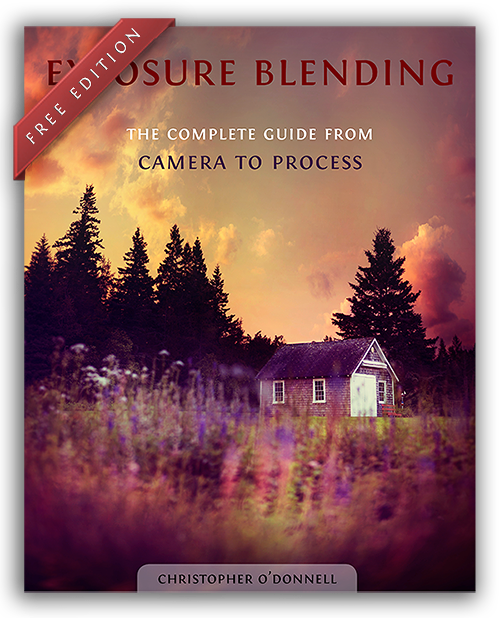 Also included with this eBook is an additional guide on exposure blending – the post processing technique Christopher uses to create his golden hour images in the digital darkroom. In this step-by-step guide, he discusses the entire process of exposure blending – from auto-bracketing in the field, to combining different exposures in post process. Exposure blending is an innovative way to combine different exposures within the same image, which is often needed when photographing the golden hours. He dedicates over 70 full-page spreads to this subject, explaining how to photograph a scene for exposure blending, and then how to import these files into Photoshop (with screenshots) for blending to create the final image. Christopher also discuss how to create luminosity masks, which is an innovative way to combine multiple exposures together for a seamless, natural blend. If you order by 10th May you can claim a 50% discount from now until May 10th with the discount code GOLDEN. I am pleased to say that I have today sold a 8.00" x 12.00" print of West Tower of Ely Cathedral to a buyer from Bryan, TX - United States via Fine Art America. Loving Landscapes eBook - get 33% OFF! Stop taking scenery snaps and start creating breathtaking works of landscape photography art that people will fall in love with. Transform your dull RAW files into breathtaking images. Discover and learn how to use Adobe Photoshop Lightroom’s landscape-friendly tools for maximum impact. Get ten free handpicked Lightroom presets to use again and again. Learn fun landscape techniques that will extend your creative horizon. Create eye-catching Landscape photos with exposure blending techniques. Loving Landscapes will demystify the landscape photography workflow by sharing almost every technique, trick and hack that authors Todd and Sarah have accumulated over the past 20 years of photographing nature together. The Loving Landscapes eBook will retail for $29.99 but as a limited time Early Bird Special you can pick up a copy today for just $19.99 USD (33% off). Following my announcement earlier in the week that I have teamed up with Best Deal Magazines to enable me to bring my US readers great discounts on subscriptions to leading photography magazines, I am pleased to confirm that I am now able to bring similar deals to my UK subscribers. The following magazine subscriptions are available at large savings on publishers prices and are all also available to buy as downloads. Digital Camera is Britain's biggest and best photography magazine. Each issue is packed with more expert advice than any other magazine with the sole aim of helping you become a better photographer. Easy-to-follow technique guides show you how to get the most from your SLR and perfect your shots in Photoshop, while the most in-depth tests around enable you to buy the very best photo gear. Better still, every issue is full of inspiring tips from leading pros. Add in a free disc of Photoshop video lessons every month and it's not hard to see why Digital Camera is the definitive guide to SLR photography. Digital Photo magazine is the first choice for photographers looking to take better pictures and enhance their images. With easy-to-follow projects, tips and techniques, every issue comes with a free CD-ROM packed with video lessons so you can learn new photo and imaging skills the smart way. Whether you’re a newcomer looking to improve your skills or a seasoned photographer looking to explore new ways to create great images, Digital Photo magazine brings all the advice and inspiration you need. Subscribe to Digital Photo magazine and benefit from the best discounts and offers available. A Digital Photo magazine subscription will also make an ideal gift or present – so buy today for the best offers, with FREE UK delivery. N-Photo is the independent magazine for Nikon photographers. Every month they bring you 132-pages of step-by-step advice on how to get the best results from your Nikon digital SLR. The camera skills section will show you how to shoot great pictures and how to edit them to make them even better! You'll be inspired by the beautiful images shot by top photographers and fellow readers. And you'll learn the basics through the Nikopedia reference pages – picking up tips from the pros with exclusive interviews and masterclasses. N-Photo is accompanied each month with an exclusive Nikon Skills video disc, which is packed with practical advice, exciting photo projects and with lessons to help you master Photoshop and Nikon's own Capture NX2. PhotoPlus: Canon Edition is the only monthly magazine 100% dedicated to Canon EOS digital SLRs, from the EOS 450D and 700D and Rebel cameras, right through to the EOS 6D, 7D and 70D, and beyond. Every month you’ll find in-depth advice and essential skills to help you get the most from your Canon D-SLR, presented in an easy to follow, jargon-free format that puts your camera manual to shame. They also work with the best Canon pro photographers in the business and get them to share their secrets! You’ll also find plenty of advice and instruction on editing and improving your shots in Photoshop Elements, plus Canon’s own free software, DPP. Every image-editing and camera techniques tutorial in the magazine has a counterpart video lesson on the free Video Disc, so you can follow the steps at your own pace. And although they are all about Canon D-SLRs, they are 100% independent of Canon. Their camera tests, product reviews and buyers guides are ruthlessly independent – and they tell you all about non-Canon accessories that will work with your camera! Practical Photography magazine is the perfect read for anyone wanting to get more from their Digital SLR. It teaches you all the camera skills you need, inspires creativity, and keeps you informed of the latest photo gear launches. Practical Photography is the magazine for everyone with a passion for photography, combining inspirational images, expert hands-on advice, and the most authoritative gear reviews. Subscribe to Practical Photography magazine and benefit from the best discounts and offers available. A Practical Photography magazine subscription will also make an ideal gift or present – so buy today for the best offers, with FREE UK delivery. Either visit our UK Photography Magazine page or click on the image to go straight to the order page for details of that particular magazine. To celebrate the launch of Incredibly Important Composition Skills, we're giving you 30% off for a limited time! This tutorial is packed with information that will help you build amazing skills – it's a steal of a deal at the regular price of $49.95. Get it today, and you'll pay only $34.96!!!! We want to make it easy for you to gain amazing composition skills. So our friends at Photography Concentrate have spent hundreds and hundreds of hours researching and designing an eBook that gives you all of the essential theory, without the fluff. You're going to gain real skills that let you create powerful images, no matter where or what you're shooting. These are skills you'll use for the rest of your life! And you're going to have a blast! This tutorial is packed with beautiful example images, practical exercises, and informative videos that'll help bring it all together. Imagine waking up tomorrow, and suddenly seeing the photographic potential in every scene around you. You have composition superpowers!! Were you bit by a radioactive spider? Nope. You just finished reading Incredibly Important Composition Skills! Get Incredibly Important Composition Skills! To help you really understand this composition stuff, we'll start with the basics and build from there. You'll pick up techniques and tools that will benefit even pros with years of experience, in a way that will feel totally accessible to beginners. Ready? Step 1: Discover the "Elements" & Watch the World Transform! When you take a photo, you probably focus most of your attention on your subject, right? But your scene contains tons of other visual information – stuff like light, shapes, lines and colors. Those bits of information are 'compositional elements'. Now want to hear something crazy? Compositional elements can have more impact than your subject does on where your viewer looks and how they feel about your image. Yikes! If you want to create effective images, you need to know how to use the elements to your advantage! When you get your tutorial, you're going to learn all about those elements – how to recognize them and what they do for your composition. You'll start with fundamental elements – those are the elements that show up in just about every scene. Then, you'll learn about secondary elements – elements that aren't as common but that can have a big effect on your composition! To be a great photographer, you need to know more than just what the elements are. You need to know how to arrange them too. In this tutorial, you'll learn 7 techniques that help you organize elements and turn them into amazing images. You know how some images just seem to feel right? Your eyes move easily from element to element, and the whole scene just feels comfortable to take in. That comes from 'balance'. In this tutorial, I'll show you 3 different ways to bring balance to your images, and how you can break with 'balance' to create photos that have more tension and drama. You're also going to learn 6 other awesome techniques that'll help you simplify complex scenes, create a deeper viewing experience using visual and conceptual contrast, and so much more! These techniques are going to have a huge impact on your images. Step 3: Get our Easy, 8-Step Process and Compose Winning Images, Every Time! Once you've got the theory and techniques under your belt, we're going to hook you up with an easy, 8-step process that'll help you put it all into practice. See, before you take the final shot, you make a series of decisions. Like where you're going to plant your feet, and what focal length you're going to use. These decisions – things you may not have thought of as real decisions at all – can dramatically influence your composition. See that tasty cake up there? A small change in where I was standing when I took the shot impacted so much of the composition: the angle of the lines on the towel, the size of the triangle where the piece is missing, the amount of empty space, and the predominant colours and visible textures. Simple change. Big results. With the 8-step process you'll learn in this tutorial, you'll have a simple step-by-step approach that strengthens your composition with each of those decisions you make. Plus, Learn a Whole Lot More! 5 common composition mistakes you don't know you're making PLUS concrete ways to fix them. How to use color to create harmony and contrast, direct attention, make certain areas of your scene pop, and more! How to make sense of any lighting situation and know how it will affect your composition. The ways that cropping can impact your photo. Save yourself from heartbreak when it comes time to print! The science behind why certain techniques just seem to work. And a TON lot more! This eBook is packed with over 300 beautiful example images and graphics that will help you see the concepts in action. It also includes fun exercises that will get you practicing your composition skills, without having to leave the house. It doesn't matter if you're a brand new shooter or an established pro, or whether you use a Mac or PC, Canon or Nikon – this tutorial is designed for everyone! BONUSES: 7 Composition Videos & Composition Skills Field Guide! Save 30% for a Limited Time Only! Try Incredibly Important Composition Skills for 60 days, and if you don't feel like you have stronger composition skills, you'll get 100% of your money back. No questions asked. And you keep the eBook and the bonuses. We've made this super easy for you! Head here to learn more about Incredibly Important Composition Skills. Then pick up your copy and prepare to transform your photos and the way you see the world! Win an FREE iPad mini Retina! We really appreciate you taking the time to check out Incredibly Important Composition Skills, so we're giving you the chance to WIN a totally FREE iPad mini Retina! Click on the image below to head to the Incredibly Important Composition Skills page, then scroll to the bottom where you can enter to win! No purchase necessary. Today's article is from our friends at Picture Correct in which Stephanie Gagnon gives her tips on improving your black and white photography. Stephanie lives in Central, Illinois, is married to her best friend, Ryan, and enjoys the company of her rambunctious lab-beagle pup, Kit. She is the owner of Green Tree Media and is passionate about photography. 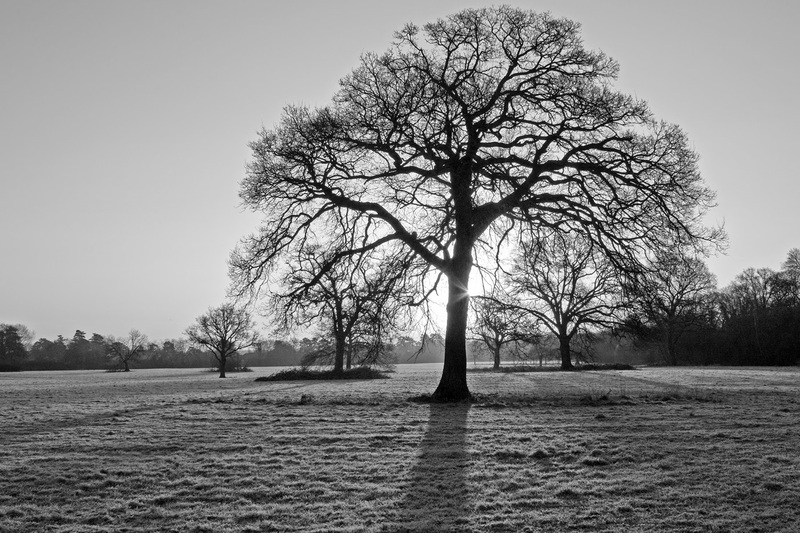 Here is my favourite black and white image, taken early one Sunday morning in January, at Pinkneys Green Common, Maidenhead, England. I am pleased to announce that I have teamed up with Best Deal Magazines to enable me to bring my US readers great discounts on subscriptions to leading photography magazines. Hopefully I will be able to offer a similar service to our customers in the UK and Europe in the coming weeks. The following magazine subscriptions are available at savings on publishers prices of between 40 to 74%! If you are interested in creative photography American Photo is designed for you. In each issue you will find profiles of the personalities behind the lens and their contributions to history, journalism, art, fashion and advertising. You will also find reviews of exhibitions and books, photos sent in by readers, stories on working professionals and much more. Digital Photo helps both the beginner or advanced, experienced enthusiast explore the exciting world of digital photography. Issues are packed with quality articles and pictures that both teach and dazzle, by showing how to control your photo production with computerized step-by-step techniques that create delightful results for the eye. Buyers guides helps you make intelligent choices about buying the best gear, accessories and software. News stories and product reviews alert you to the best of what’s available. How to tips and techniques from pros and fellow photographers provide illustrated step-by-step techniques for composing better photos. And photo contests allow you to showcase your skills. If outdoor photography is your driving passion and you‘re a serious amateur or experienced professional who needs to perfect your hobby or craft, then Outdoor Photographer is the essential magazine you need to learn from and enjoy. No matter your preference, be it digital distance or traditional close-up, Outdoor Photographer will inspire you with practical, how-to shooting techniques on landscape, dawn, sunsets, mountains, lakes, wildlife, adventure, action and sports. Quality articles are written by renowned experienced professional photographers, who have an inherent understanding of your needs, because they’ve been where you are. Breathtaking and first rate photography provide inspiration and motivation. Each issue is packed with new product and equipment reviews, lively how-tos on lighting, exposure, filters, gear, and practical advice for preparing yourself and your gear to face arctic cold, searing heat or sweltering humid environments. Popular Photography is the photographer's comprehensive source of information and inspiration to aid creativity and enhance the enjoyment of photography. Each issue of Popular Photography includes articles covering extensive analysis of new cameras and equipment, techniques, folios by leading photographers, photo composition, production, color, darkroom operations, travel and nature photography, video making, and buying guides to help beginners, hobbyists and professionals alike broaden and improve their photography skills. SHUTTERBUG is the leading photo and imaging magazine for advanced amateur and professional photographers, and all who relate to their photography as a meaningful part of their lives. Inside every monthly issue you'll get lighting pointers, pro studio tips, test reports, equipment reviews... and much more! Written by photographers, for photographers, Shutterbug is dedicated to helping photographers enhance their creative potential. Digital Photo Pro is the professional's guide to going digital and is designed for the digital photography enthusiast. Each issue of Digital Photo Pro arrives filled with shooting tips and techniques, product reviews, business advice, and relevant industry news and inspiring digital images. You'll find feature stories and articles that explore unique topics of interest such as mobile lighting, software evolution, creating digital archives, transitioning from stills to video and more. Learn from the best and refine your skills with the help of Digital Photo Pro. Either visit our Photography Magazine page or click on the image to go straight to the order page for details of that particular magazine. 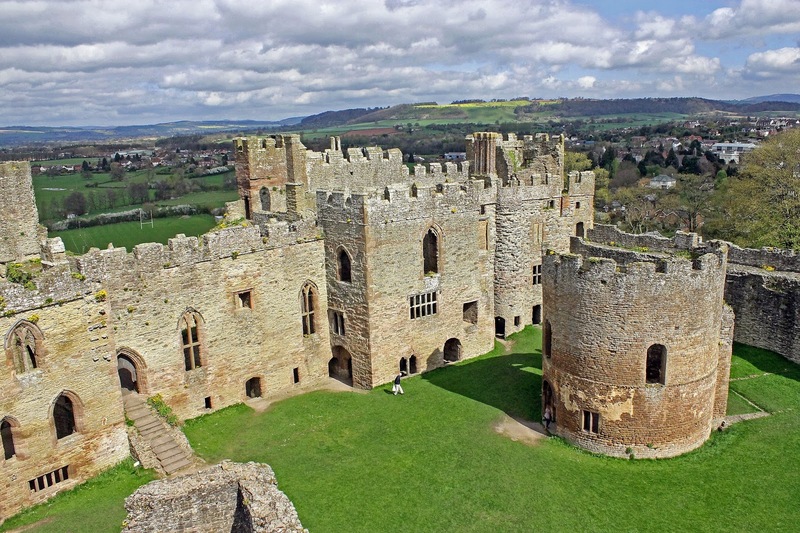 Visited Ludlow, Shropshire a few days ago, and here are the first of the images I took of Ludlow Castle. Ludlow Castle showing the Great Hall and the Chapel of St Mary Magdalene with its circular Nave. 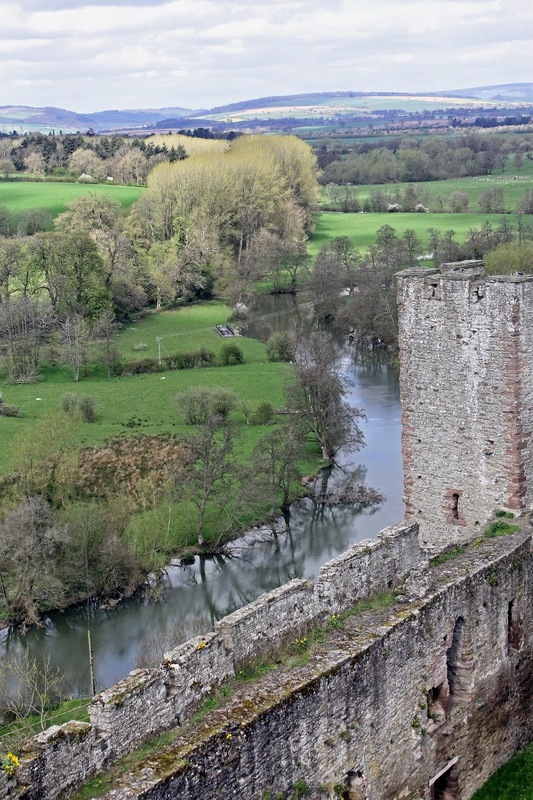 The River Teme providing natural protection to Ludlow Castle. 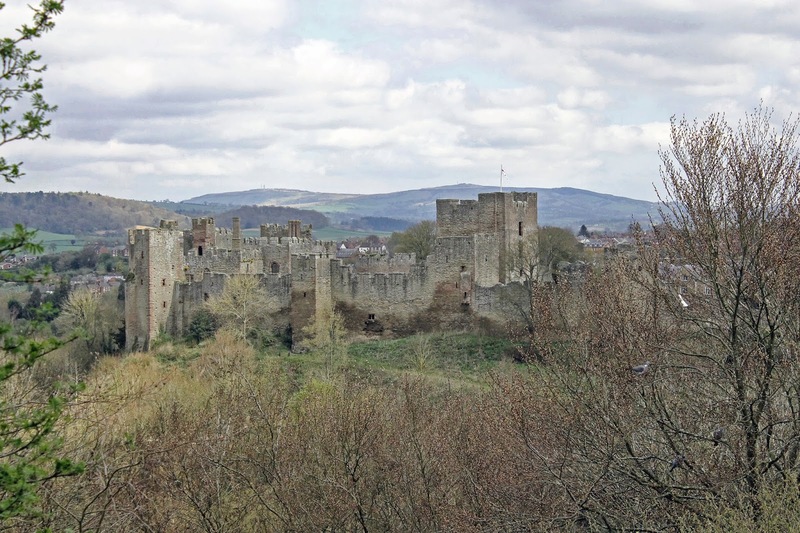 View of Ludlow Castle, viewed from Whitcliffe Road, Ludlow, Shropshire, England. As usual, all of these photos are available to purchase as original Wall Art, in a variety of formats including as greeting cards or iphone cases from Fine Art America and Photo4Me - just click on the links below each image. Earlier this week I made my first attempt at creating colour popped images in Photoshop elements. I hope you like them! A Victorian Post Box situated at East Gate, Warwick, England. The iconic Routemaster Red London Buses in Whitehall, central London.